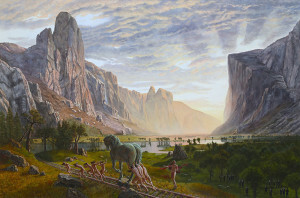 Pierre-François Ouellette art contemporain is proud to present new paintings by Kent Monkman. In keeping with earlier works that explore the mythologies of Western culture illuminating truths about European colonization of North America, Monkman casts his alter ego in the roles of four powerful and mythological females: Danae, Leda, Minerva and Helen of Troy. 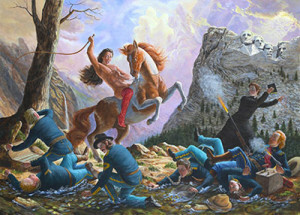 Against the lush backgrounds of romantic landscapes, Monkman employs the allegorical and sensual language of classical painting to condemn the violation of the land and First Peoples of North America. Borrowing ancient parables from Western cultures as lessons against deception and disguise, Monkman’s paintings reference the lies, failed promises and broken treaties perpetrated by the Canadian and US Governments against indigenous people.